After almost a year in Early Access on Steam, DUSK finally makes its full release on the platform. The game, reminiscent of the brutal shooters of the 90s such as DOOM from 1993 and Quake from 1996, is a high speed, bloody, shoot-em-up style first-person shooter. To mark the occasion, New Blood Interactive, the developer of the game, has released an all-new launch trailer to highlight the insanity. You can check it out below. While the game is as brutal as it can get, the final scene of the trailer shows that it doesn’t take itself too seriously, suggesting the game will simply be classic, 90s fun. The game is broken up into three single-player chapters: The Foothills, The Facilities, and the new Nameless City. Much like the retro FPS games that it takes inspiration from, players will trek their way through levels crawling with baddies to reach the exit point. Players will wield a varied arsenal consisting of shotguns, pistols, machine guns, crossbows and more to absolutely decimate all who stand in the way. An appropriate soundtrack of heavy metal music by Andrew Hulshult pairs with the game like a fine wine, giving a sense of satisfaction while blowing cultists and demons to smithereens. 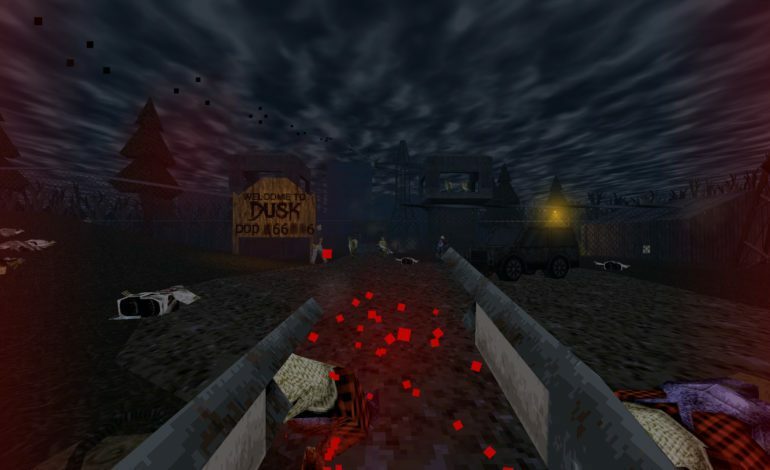 Multiplayer will also make an appearance in the game in the form of 16-player deathmatch called Duskworld. While DUSK is available now on Steam, the game is also slated for a release on the Nintendo Switch, teased during E3 this year. An official release date for DUSK on the Nintendo Switch has yet to be announced. You can pick up DUSK now on Steam for the discounted price of $16.66 (the Number of the Beast most likely not a coincidence) until December 17. After that, the game will cost $20.00.